Be the first to share your favorite memory, photo or story of Luella. This memorial page is dedicated for family, friends and future generations to celebrate the life of their loved one. Luella Dencklau Hinderks, 93, Webster City, passed away, Wednesday, March 13, 2019, at the Israel Family Hospice House in Ames. The family will receive friends and relatives for visitation on Saturday, March 23, 2019, at Trinity Lutheran Church, Webster City, IA from 9:30 – 10:30 AM Followed by the Funeral Service at 11:00 AM with Rev. Mike Kroona officiating. Burial will be in the Graceland Cemetery. The family has chosen Boman Funeral Home (www.bomanfh.com) to care for their needs. Luella was well known in the community and called Grandma by many. She enjoyed spending time with her friends at McDonald’s, Hyvee, card club and bingo. She loved people and went out of her way to help others, often buying the kids meal at McDonald’s just to have a toy to give to a little boy or girl. Some of her favorite times were spent snuggling with her great-grandson Kayden and fishing. She even caught a large Northern this last fall. Luella also enjoyed playing cards, flipping quarters, music, making “scrubbies” and time spent with friends and family. She was a member of Trinity Lutheran Church. Luella Hinderks (Dencklau), daughter of Edmund and Elfrieda Dencklau, was born February 7, 1926, on a farm south of Vincent. She attended school at Colfax #3 in Vincent. 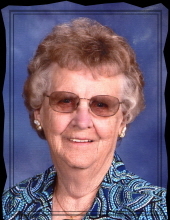 On Nov. 26, 1946, she married Dennis Hinderks at St. John's Lutheran Church, south of Vincent. The couple resided in rural Kamrar. In 1948, the couple moved to Webster City. Mrs. Hinderks was a homemaker and worked with her husband farming in Hamilton and Webster Counties. In 1975, the couple moved north of Webster City. Mrs. Hinderks is survived by her daughter-in-law Leah Hinderks of Webster City; grandchildren, Wade Hinderks and Emily Chan of Boone; Nicole and Matt Ross of Boone, Jay and Jami Hinderks of Salem, OR; great-grandchildren, Kayden, Carter, Madelynn, Mason and Henry; brothers Dennis Dencklau, Gerald Dencklau and wife Merry Jo; sister-in-laws, Karen, Ruth, Lorraine and Lanita Hinderks ; and numerous nieces and nephews, who were very special to Luella. She was preceded in death by her husband Dennis; sons, Dennis Edmund Hinderks and Larry Henry Hinderks; her parents, brothers, Francis and Leo Dencklau; brothers-in-law, Arvin, Kenneth, Leo, Merrill, and Eldon Hinderks; and sister-in-law Doris Hinderks. To send flowers or a remembrance gift to the family of Luella Hinderks, please visit our Tribute Store. "Email Address" would like to share the life celebration of Luella Hinderks. Click on the "link" to go to share a favorite memory or leave a condolence message for the family.